Two books in one, this chunky activity book is packed with holiday scenes for children to colour and complete with stickers of animals on their holidays. With over 200 stickers of jaunty little animals, to add to scenes including a fun fairground, an exciting water park and a trip on an aeroplane. Children can colour in the animals as they take a trip to the lake, go swimming in the pool and sit around the bonfire on a camping trip. The ideal companion to any long journey or holiday – this book will provide hours of entertainment and lots to talk about. I really rate the Usborne sticker books as there is so much going on for children of all ages to engage with... This one is good as half of it is a sticker book following the characters as they prepare for their holiday and then the activities they do, the second half is for colouring in their adventures. 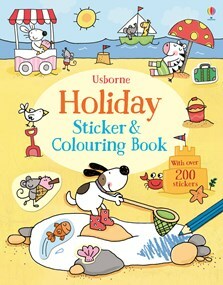 The Holiday Sticker & Colouring Book is a fantastic rainy (or sunny) day activity book for young children this summer.